XmlTools: do you need to post-edit the sound xml file? Otherwise you could use a normal text writer to create them. Just curious why it is needed. It is not a requirement. I could just use an XML library or even a simple file library for that. However at the time I wanted to integrate XmlTools with Vago and I thought I could use it for the sound wizard. It basically reads some (template) xml files inside the executable, the XmlTools edits them accordingly with the users choosen options. This technique has also the advantage of if for some reason these Xml files structure change in the future I just need to replace the templates files which sounds better to me in terms of maintainability. Of course the idea of the XmlTools integration is also to make it easy in the future to add Xml options or features to Vago. BTW I added the tickets to the bug page. Happy coding. ... One of those rainy weekends I still have to do the impulse sound docu. I've saw them. Thanks paradox. Although I don't promise any new version shortly. A special thanks to paradox for the feedback and suggestions. Updated, the main new feature is an XmlTools interface which had been requested for some time. It has also a simple Xml file comparison so you can preview an XmlTools command before applying it (this file comparison is very simple and shouldn't replace a full file comparison program). - Added a XmlTools interface. Click in the XML icon in the main window. options were checked in levels tab when a project was loading. This was fixed. What do you guys use to make these things and how hard is it? What do you refer by these things? Are you talking about Vago application? Well you need to know programming (maybe java or python are a good starting point), then you need to learn how to build basic user interfaces in these languages, then read a little about oni xml structure in oni wiki page and finally connecting you application with onisplit. It is not that hard (if you already know some of the basis above) but can take a bit of work. What about c++ or c#? C# is kinda like Java imo but you will only be able to develop desktop programs with interfaces for windows (with win forms or wpf). C++ is more low level so it is a bit harder to learn but once you know a bit it is really a powerful language, one of the best to develop desktop applications with interfaces for multiple operating systems in my opinion. It was made with AE in mind, it probably can work with vanilla too (selecting oni vanilla folder as AE) but AE is the way to go. No other dependencies as long as you install it from AE installer tools menu. thanks, i'll try it out. also props for coding something like this. i have vago 1.3. how do i extract character into a .dae format. the character tab has trbs and other format that i can't direct extract from the gamedata folder. how many conversions do i have to run to get .dae from simply a .dat format. First thing go to the Levels Tab Select from DAT and to ONI Files, then click ADD and then go to Game DataFolder and select Level0_Final. Now go to Characters Tab, select from TRBS / ONCC ONI to DAE. 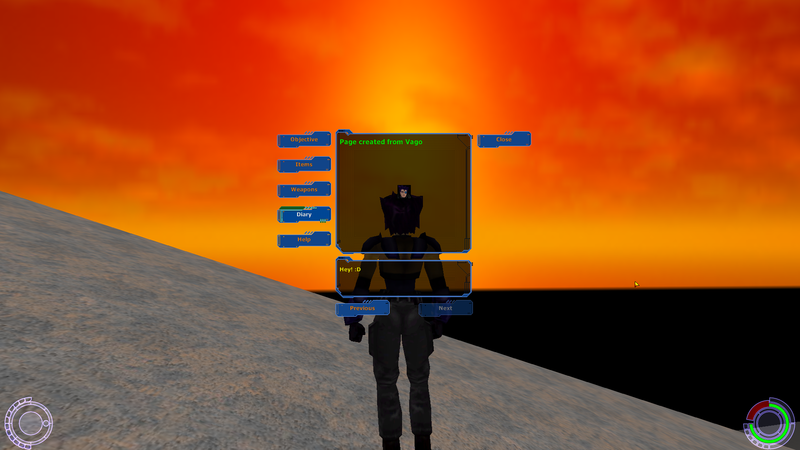 click ADD go to Vago Workspace/Levels/DAT - ONI Files/level0_Final/ choose the TRBS or ONCC you want. thanks man, u come through. don't look like i can use it though. com guy look like he been ran over by a pick up truck. rotation vector are all jacked up. since oni dont' use bones apparently, his arm are all dilapted. i almost want to show u the picture but it's to gruesome for this forum. New version. Happy new year everyone! 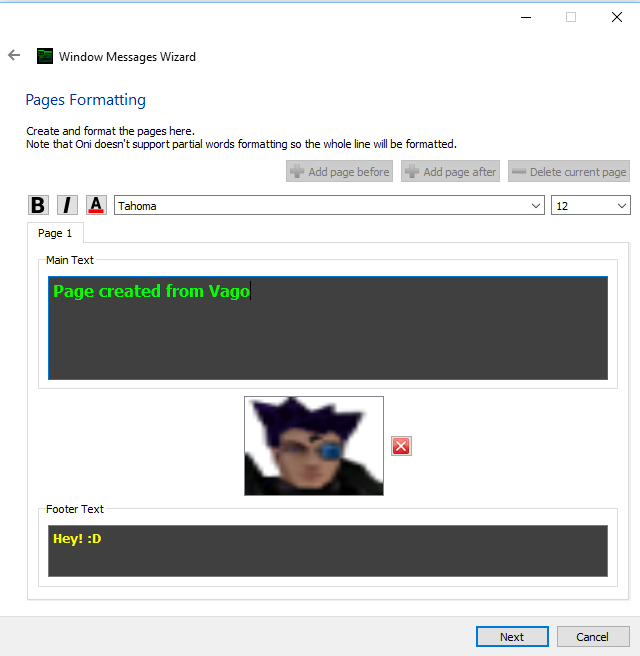 - Fixed paragraphs not being created in "Window messages wizard"